Arthur Conan Doyle may have told us what Sherlock Holmes looks like, but it was Sidney Paget who showed us. Paget's illustrations permanently cemented the image of Sherlock Holmes in the public consciousness, influencing the character's depiction to this very day. The Complete Paget Portfolio gathers every illustration Sidney Paget created for the original Sherlock Holmes stories, reproduced directly from the pages of The Strand Magazine itself. And now, for the first time anywhere, you can compare Paget's published images with his original artwork! In cooperation with the owners of the remaining Paget originals, we have lovingly reproduced 22 of the artist's illustrations in color directly from the original art boards! 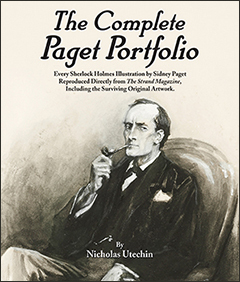 The Complete Paget Portfolio is the ultimate archive of the art that created the universal image of Sherlock Holmes. "Fascinating book. I marvel at the images of the originals, and the ways in which they were reproduced in The Strand. Well done, all."